WASHINGTON DC, WASHINGTON, UNITED STATES, July 5, 2018 /EINPresswire.com/ -- In this modern highly competitive world, every entrepreneur is looking for tailor-made, scalable and high-quality custom software development solutions for their businesses to perform all the functions at a faster rate and provide quick results. The demand for business software has increased the importance of developing customized software solutions more and more. Therefore, GoodFirms publishes the list of Top Software Developers worldwide based on their knowledge in software domain and excellence of work. At present, there is a number of companies offering software services from all across the world who are claiming to be best at their work. So, it is really important to analyze and hire the Top Software Developers in India or from another country, state or city that can facilitate you with business software as per your exact requirement to reap more and more advantages from it. 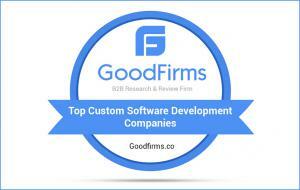 Washington, DC, based GoodFirms is a renowned worldwide B2B research, ratings and reviews firm. This company reveals the top custom software development companies around the globe to help the service seekers to get connected with the Top PHP Developers as well as highly skilled professionals for all other various types of languages for developing software. The research team of GoodFirms conducts a meticulous assessment which follows a process including a number of qualitative and quantitative statistics along with their years of experience in the software domain, their market presence and takes a glimpse at what client have to say about their work. After this process, all the companies are compared and allot a total score out of 60. Then the companies are indexed according to the research score in the list of top IT companies and software. Moreover, GoodFirms invites the IT and software companies and developers to come forward and take part in the on-going research process to win the opportunity get listed in best companies as per their expertise and be visible to more customers.